The book of Allah is the best source of guidance for this world and the next. As Muslim parents, we want our children to be of the successful ones in the hereafter, and undoubtedly one of the best ways to connect our children to the deen is to connect them to the book of Allah. 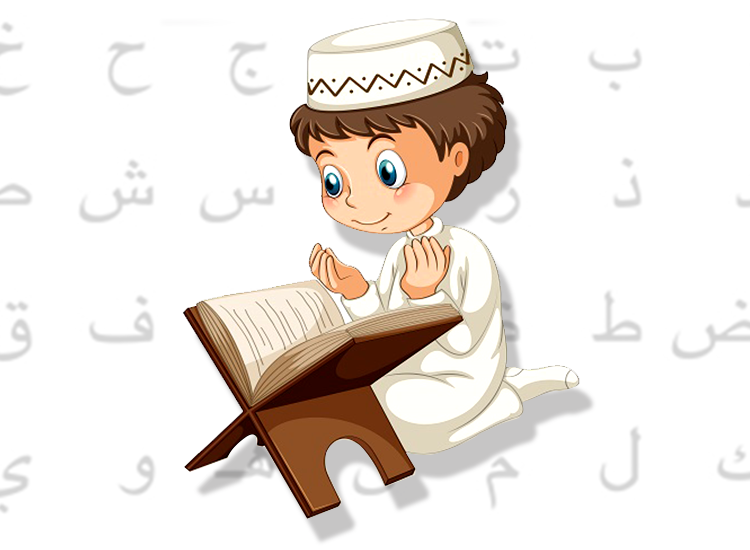 Informally, you can start teaching the Quran when the baby is just 4 months old in the womb! It is at this time that the foetus develops its sense of hearing, and playing the Quran for the baby will familiarize the baby to the Quran. Research suggests that babies who hear music in the womb recognize it after birth as well. Let the melody of the Quran be one that reminds your baby of the comfort of the womb. Lull your baby to sleep while reciting the Quran, and also while breastfeeding to create positive associations with the sound of Allah’s Words. Formally, each child differs in his ability to decode the written text. Your children will already be familiar with the Quran through the conscious auditory training you have done by playing the Quran for them. Continue doing that with your children but as they grow older, seat them in your lap and let them follow the text you recite with their fingers. This indirectly creates the understanding that what you are reciting is made up of separate words and that these words can be expressed in printed symbols as well. Reading readiness has been defined as the point at which a person is ready to learn to read and the time during which a person transitions from being a non-reader into a reader. As your child grows up, it is time to look out for signs of readiness to gauge when to introduce the actual teaching of the alphabets. Generally, children can start recognizing alphabets at the age of 4, and you can slowly start introducing the different Arabic letters. If your child retains the symbol and the sound over the next few days, introduce a new letter. However, if your child is unable to do so, do not become impatient and give it some more time. When you feel that your child is able to recognize the alphabets and retain the letter-sound correspondence, you can start to actively teaching the Quranic Alphabet through using multi sensorial means. For example, making Arabic letters out of sand paper for tactile tracing is a great idea .You can make the letters in both their full form, and the half-shape the letter acquires when joining with other letters. Another idea is to make flash cards of objects that begin with that sound. If you want to teach Arabic at the same time, use corresponding objects from the Arabic vocabulary (such as Jamal (camel) for the letter Jeem). However, if that is something you cannot do, make flash cards of objects in the child’s mother tongue to serve as a visual cue to remember the sound of the letter. Inset puzzles of Arabic letters are widely available and can also be used. Making fun worksheets to colour, cut and paste, or mazes can add to the fun as well. Also make some fun games like the memory game or snap with the vocabulary and letter cards to reinforce as well. The basic Qaidas widely available in the market are a great base to use for lesson planning. However, keeping in mind your child’s learning style (visual, auditory or kinesthetic) and then come up with ideas to make learning fun and interesting. Do not make your lessons based entirely on flash cards and worksheets. Incorporate different role plays (such as pretending to be a certain letter and only eating those foods), outdoor play (such as treasure hunting for different sounds), cooking (such as making alphabet shaped cookies) and sensorial play (such as tracing in sand, salt or shaving cream) to encourage sound learning. As you move on to blending the letters with the harakaat (fatha, kasra and damma), remember to incorporate similar multi-sensorial activities. You can even play sorting games where all letters that make the sound “aa” (that is those with fatha) go in one pile and the ones that round your lips (those with damma) go in one. Reading is of three types: one that is done for fluency, one that is done for accuracy and one that is done for pleasure. Increase your child’s fluency by revising what he already knows, and letting him repeat that to create feelings of success. In the same lesson however, give something that is challenging which the child has to concentrate on to create accuracy in his decoding skills. At the end of every lesson, recite some portion of the Quran or play his favourite Qari so that the lesson ends on a pleasurable note. If your child is not responsive, defer the lesson and do something more fun. Maybe a game such as “who’s the Qari?” where the child guesses whose Qirat you are playing. If your child is having difficulty with a certain part, use highlighters to mark hints for the different rules of tajweed. You can also make flash cards with the words the child keeps getting confused with for a flash card drill. Since all reading eventually becomes sight reading, flash card drills can be a great tool to help with instant recognition of similar looking words.